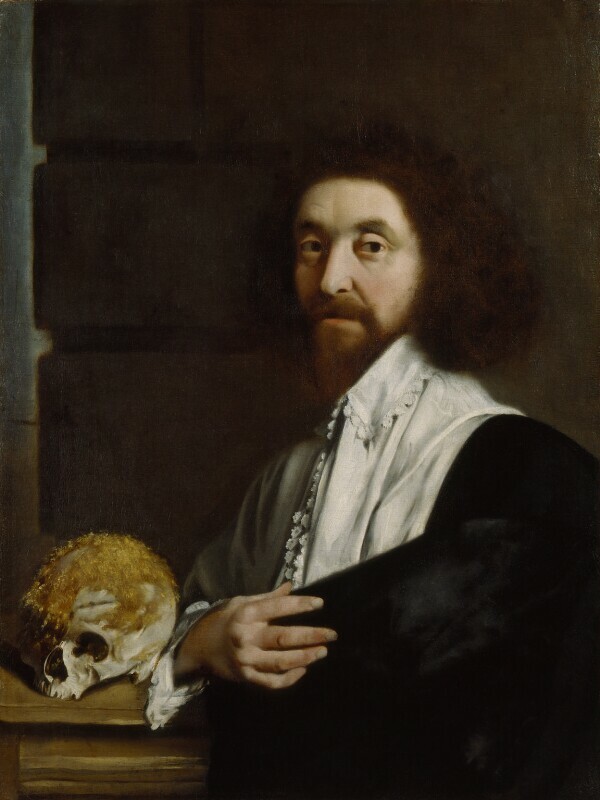 ‘The mosse of a man’s scull’, as seen in NPG 1089, was considered in the seventeenth century to be a remedy for the falling sickness  and presumably explains the iconography. The attribution of this ‘sharp, brilliant image’ as Piper described it in 1985, together with other distinctive Tradescant portraits in the Ashmolean Museum, remains slightly insecure. NPG 1089 had previously been attributed to Isaac Fuller, Dobson, Emanuel de Critz - Hester Tradescant, the sitter’s second wife, was, somewhat tortuously, related to the de Critz family – and Thomas De Critz who is now considered the most likely candidate. Collins Baker had first identified de Critz as the probable author of the Tradescant portraits . The date of 1652 first appeared, unsubstantiated, in the Christie’s 1897 sale catalogue; it is possibly correct. 1) R. Hooke, Diary, ed. Robinson & Adams, 1935, p 263, 17 December 1676. 2) Cf. M. Whinney & O. Millar, English Art 1625-1714, 1957, pp 83-84. 3) See the scrupulous archival account by M. Edwards, Wal. Soc., XLVII, 1982, pp 147, 149, 150, 159. 4) C. H. Collins Baker, Lely and the Stuart Portrait Painters, 1912, I, p 122. M. Edwards, Wal. Soc., XLVII, 1982, p 159. D. Piper, Catalogue of the Seventeenth Century Portraits in the National Portrait Gallery 1625-1714, 1963, pp 350-51. D. T. Piper in A. MacGregor, Tradescant Rarities, 1985, p 296. Lined; cleaned 1976; slight blooming. [Strawberry Hill;1 Sotheby’s, 22 June 1842, lot 92 as by Fuller), bt. Cotton; Sotheby’s, 19 July 1845, lot 105 as by Fuller)];2 Debrée-Chepmell, London;3 Christie’s, 30 January 1897, lot 136 unattributed, as 1652), bt. Colnaghi; purchased. 1 ‘Tradescant junior with a skull covered with moss for the powder of sympathy’ (Description of Strawberry Hill, Walpole, Works, 1798, II, p 405, Waiting Room). 2 The 1842 and 1845 sales as indicated by W. S. Lewis in 1957 (notes on file). 3 This name given as the vendor by a MS note in the NPG copy of the sale catalogue. RA 1956-57, no.66 unattributed; Elias Ashmole and his World, Ashmolean Museum, Oxford, 1983, no.77 as by Emanuel or Thomas de Critz. This extended catalogue entry is by John Ingamells, one of a limited number of entries drafted in 2010 for the incomplete catalogue, Early Stuart Portraits 1625-1685, and is as written then. For the most up-to-date details on individual Collection works, we recommend reading the information provided in the Search the Collection results on this website in parallel with this text.